Power is contagious; power is venom. Once this silent poison gets into the system of any human, it deteriorates the ability to think and annihilates any humanity that is left within. 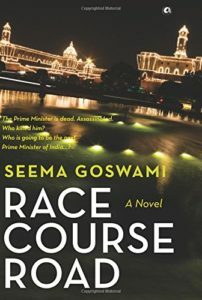 ‘Race Course Road’ is a political thriller that reeks of hatred and deception. With distinctly etched characters, the novel is riveting and interesting. The book will be a good read for the ones who are politically well informed. “Race Course Road” offers a miscellany of emotions ranging from love to hatred. The story elicits the conflict between Karan Pratap Singh and Asha Devi, who are bonded by blood that is not strong enough to withstand the tension between them.